The weekly plan is for 40 lessons per term based on 40 minute per lesson, usually 4 lessons per week, each lesson block is broken up into LESSON, TUTORIAL, WORKSHEET or WEBQUEST, TEST and HOMEWORK plus a row to say when Tasks are issued or required. Students will be given one or more of the above to work on during the lesson. There is sufficient here to start a complete year with tutorials, tests, web quests, worksheets, lessons and homework all with solutions. It will just depend on the tasks that you wish to use that will determine the structure of this yearly plan. Your students will need to work very hard to maintain all this workload so feel free to modify the scope of work to suit. If your students are completing Stage 2 and 3 or Cert II IT some components will be duplicated. My students used a web page to submit their work to me using web pages created with Dreamweaver, in week 1. For tutorial lessons, worksheets, web quests or tests I allow one lesson per week for free catchup work or revision, or to review tutorial skills. I provide four Tasks and plan these for the first three terms, with an additional revision or evaluation project or additional assessment task in term 4 if it is (or I feel it is required). If we use a handbook or manual this work will be undertaken during the free day. Worksheets Web quests explain the elements of the topic with questions and test sections for students to answer, all come with a solution sheet for the teacher. Web Quests cover topics where students must find information on the Internet or in Resource material and answer all questions.Most come with a solution sheet for the teacher. THREE YEAR ROTATION: I basically ran a three sets of tasks for stage 2AIT and rotated them over a three (3) year cycle, with modifications to suit changes in the curriculum. 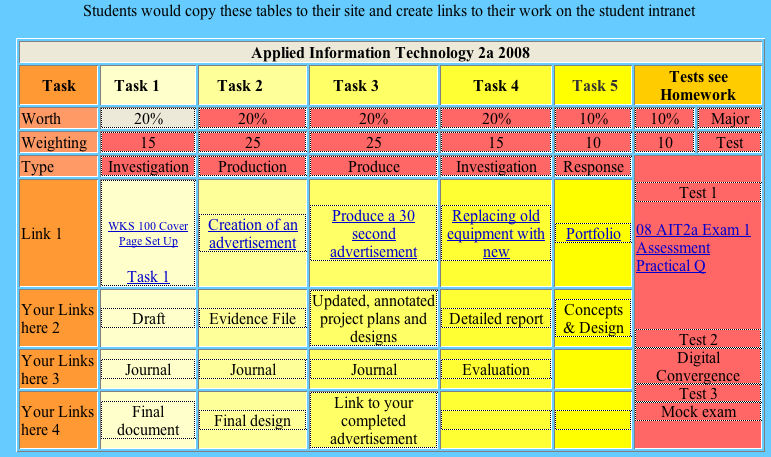 The training packages would obviously change to suit the set of tasks and you really only need to cover the set (Investigation, Plan, Response and Produce) so once I had my year set I just rotated them, this way year 11 students taking AIT2 would not hit a repeat of a task as year 12 student the following year. The AIT Lesson Plan tended to follow the same pattern each year and covered the subject course requirements so I created lots of software training worksheets and some tests and exams to suit each set. I like to throw lots of work at the kids and do spread the tasks over Term 1, 2 and Term 3 but as you can see on this plan I get three tasks underway early and will try and start Term 3 Tasks in Term 2, (Remember year 12's do not do much in Term 4). A sample basic lesson planner is here. I spent a lot of time on developing sofware skills and used web quests and quizzes with solutions to help students understand terminology and content. I always made my students create a web page with links to all their work so I could get to their work on line through the school intranet. This made life very much easier to mark student work. A sample of how a student AIT Site web class looks is here. transfer over networks—email, internet, intranet. WBQ101 Web Quest Design Principles Explains the various principles of design including the old SPARC principles, students answer questions as they work through the document. explain the use of project teams i.e. team members working collaboratively in the same or different locations. Time for in class work on web Quests, worksheets or Task 1 Discussion about any aspects of this course with students. benefits of using digital media compared to print media e.g. emails replacing letters, digital photos replacing film photos. Notes This is a major task that can be use as a production task, it is a working document of student skills built up after lessons and worksheet exercises. It should be used as an adjunct to a revision document that includes the student's physical production and research of most areas of ICT - The Power Point Master can be used as a teaching tool for ICT topics.